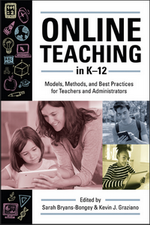 Online Teaching in K-12, Edited by Sarah Bryans-Bongey and Kevin J. Graziano | Information Today, Inc.
"Offers strong guidance for leaders and educators shaping the future of K–12 online education by providing practical, research-based approaches for high-quality, effective online instruction." Online Teaching in K–12 is the essential hands-on reference and textbook for education professionals seeking success in the planning, design, and teaching of K–12 online courses and programs. This skillfully edited book brings together more than two dozen experts and practitioners to present an array of innovative models and methods, successful programs and practices, useful tools and resources, and need-to-know information on diverse aspects of online teaching and learning. "A timely and thorough compendium focusing on theoretical frameworks, student diversity, and strategies for teaching and learning implementation in the K–12 space ... a must read for educators who are using online components in the classroom or wondering where to start."